Businesses in Central New York have relied on Air Temp to take care of their commercial heating and air conditioning installations. Our commercial HVAC technicians are trained and equipped to handle any HVAC service, from new installations to routine maintenance and repairs. We offer the most efficient brands and models available for your business, and our team is dedicated to providing our customers with quality HVAC installations performed by highly qualified and highly trained technicians. 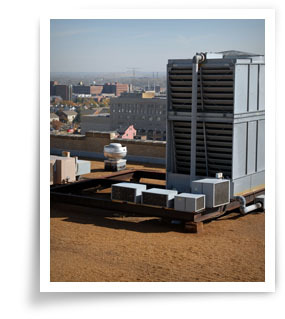 Call us today to learn more about what we can do for your commercial HVAC requirements in Binghamton, Utica, Syracuse and throughout Central New York. Having a high–efficiency new HVAC system installed for your business is one of the most drastic ways you can save money on your energy costs. Depending on the age of your current system and type of facility you own, a high-efficiency heating and cooling system could potentially cut the energy bills in half at your facility. Choosing the most efficient system for your business or organization seem to be a daunting challenge due to all the various factors to consider. Our team has over 30 years in helping businesses choose the most efficient and cost effective HVAC solutions for your facility. In addition to helping you make a decision about the best–suited system for your commercial business, we provide expert installation services in Central New York and surrounding areas. Our team always gets the job done with minimal disruption to your business. Our commercial HVAC field technicians use state-of-the-art tools and techniques to determine what type of heating and cooling system will best serve your facility. After our initial assessment, we can recommend the best cost-effective solutions that meet and exceed the needs of your business. Our goal is to install an HVAC system that maximizes efficiency and comfort for your business and leaves you beyond satisfied with your new system. If your facility is in need of a new system, contact us today or visit our information request form.